Its been several days since I last updated the blog and frankly I’ve been so busy I haven’t even had the time to read the other blogs we follow. You may recall I was considering using the finger joiner attachment to the router table to make the corner joins on the two large bed drawers. Well I did do this with one of the drawers and whilst the joints are quite strong, aesthetically I wasn’t pleased with the result. There was far too much ‘tear-out’ from the router blade. I don’t suppose I should be surprised by this as the plywood grain goes in all directions. The bed frame has now been varnished. You might be wondering why I would bother varnishing the frame as none of it will be visible. The varnish is my effort to combat the possibility of the timber swelling and contracting during the seasons. Well that’s my theory. For the first time I have some photos of the combined bed frame. The view from the foot of the bed. There is no plywood infill panelling (for structural bracing) at this end because I intend to make panels from Jarrah. The two halves of the completed bed will be screwed together down the middle. Making the bed in two halves will (we hope) mean it will be easier to move. The head of the bed. I’ve been giving some thought about the design of a bedhead. Side elevation. Two drawers at the ends and one large drawer in the middle. The next step was to fit the drawer runners to the bed frame. My method was to make a jig from scrap timber. This gets placed vertically inside each drawer compartment and held in place with clamps. The jig is square and the bottom clamped parallel with the bed base. This should result in the runners being parallel with the base and each runner should be positioned exactly the same. Once I had fitted all the high runners I cut the jig down and used it to fit all the lower runners. Eventually all the runners were fitted. My attention then went to the drawers. The first step was to make up a filler and use my putty knife to fill all the nail holes and other imperfections. The drawers will need a second sanding to smooth the filler before they get a coat of varnish. It appears I’ll need to buy more varnish as I’ve almost used all of the first litre. Jan and I discussed the width of the bed and decided it will be 6ft (kingsize). she is now researching waterbed mattresses. I went back to the hardware store to look at Jarrah timber. The bed pine framing timber is 42x18mm and you will understand my annoyance when I discovered their Jarrah was 40x18mm. It’s 2mm too narrow. Either I find another timber supplier or I will be forced to buy 60mm Jarrah and rip it down to 42mm on the saw. That T15 torx screw preventing me from continuing the dismantling of the Dyson is proving to be a problem. It’s located down a 100mm shaft and none of the local tool suppliers have a suitable screwdriver. Eventually I found two potential online suppliers. One in China and the other in the UK, both selling the same screwdriver. The seller in China wanted A$1.49 and the UK seller wanted A$15.76 (plus postage). Not hard to guess which seller received my order. The only issue with the Chinese seller is the delivery date of late November. But then there are plenty of other projects to keep me occupied. Having previously made the decision to attempt to ‘finger join’ the corners of the two large bed drawers I needed to find the Triton Finger Joiner attachment for the Router Table. It’s not small and finding it didn’t prove to be very difficult. However finding the router bit proved to be more problematic and then there was the issue of “rust” <eek>. Plenty of sanding and WD40 solved the rust issue. It was then a case of scratching the ‘grey matter’ in an effort to remember how the finger joiner actually worked. Rather than launch myself into cutting the drawer sides I decided to make a small test box. Seven years ago I would have jumped straight into the task, but watching the joiners at Aldermaston fitting out Waiouru made me realize I should take my time and do test cuts, etc. The trial proved to be rather satisfactory and I was pleasantly surprised by the minimal ‘tear-out’ with the plywood. It’s a long weekend here in Western Australia (Queens Birthday Weekend. The equivalent of a UK Bank Holiday) and I decided not to annoy our neigbours with extensive use of power tools. Therefore the finger joining of the first large drawer will take place tomorrow. Six months ago I’d have pulled the pins and cruised somewhere remote to create some noise! With time on my hands I decided to wash and polish the 4x4. The washing went OK but from that point it was all downhill with the rain settling in for the day. Of course Jan blames me for the rain. Apparently I shouldn’t have washed the vehicle. The isn’t much I can do with the media server as it is SLOWLY copying the data from the backup disks onto the server RAID. Another 24 hours should see that completed. Looking around I decided to do some work on the 4x4 accessories. The jigsaw proved very useful in cutting the piece of Perspex my brother gave me. It then needed to be cleaned using some of that very useful Yorkshire ‘Pink’. The Perspex will bolt under the lip where the bonnet meets the mudguard immediately behind the left headlight. I decided the Voltage Sensitive Relay could go on the reverse of the Perspex as it’s an automatic device which will not require access (I hope). The 125amp 12V circuit breaker will go on the front along with the 12V relay for the future light bar. The back showing the mounted VSR. At the moment all this is temporary. When I have the cable leads and crimped lugs made I intend to take everything apart and reinstall it. When I do this I’ll apply some Sikaflex adhesive to all the bolt threads in an effort to ensure they won’t vibrate loose. Another trick I learned during the boat fitout. I don’t have a large cable crimper for the lugs so this project has now come to a temporary halt. The weather has been rather wild during the last 24 hours with unseasonal strong winds and heavy rain. After reading about local flooding we decided against venturing out, delaying the trip until tomorrow. The driving rain was coming under the lean-to roof where I’m making our new bed and I had to move the bed frames in an effort to avoid them getting wet. However the rain didn’t prevent me from continuing with the project and by the end of the day I’d made a further two drawers. This leaves only the two deep centre drawers to be manufactured and I’ve decided to use the Triton finger joiner to make the drawer corner joints. Back inside the house I continued disassembling the Dyson vacuum cleaner until I struck a T15 Torx screw down a deep and narrow shaft. I don’t have the necessary tool to remove the screw so work came to a halt. However I did (finally) managed to remove the yellow clutch knob. You can see it’s rather mangled. The problem was I was prying away on the wrong edge thinking the enter yell plastic section had to be removed whereas there were actually two separate components. Once I realised that the knob came out leaving the other part behind. You can see the yellow portion of the clutch knob is still in the cleaner and it doesn’t get removed to access the clutch assembly. Another lesson learned. After soaking the rusted bearings from the ends of the roller brush in WD40 they remained seized. Guessing replacements from Dyson would cost a small fortune I went on eBay and sourced five similar sized <I hope> bearing from China for $1.49. Delivery is early November, but weren’t not in a hurry! On a more positive note the media server RAID is now working and I’ve started copying our videos to it from the backup external disk drives. Emby Server has been installed and configured and I’ve even been able to do some test viewing with the Kodi client on the Tablet. There’s still some way to go with this project. We have been feasting on Jan’s tasty homemade butter. I’ve discovered it tastes great when you place a slice of fresh bread either side! 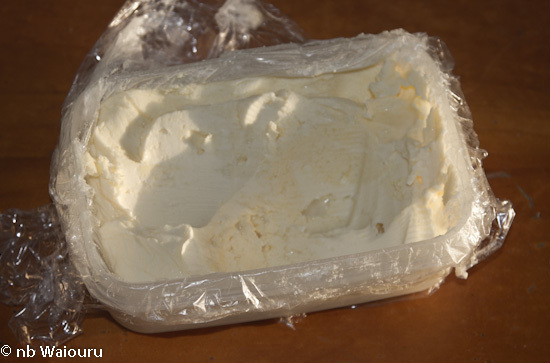 She places cling wrap in the container first which means the container simply acts as a mould. The bed project is moving ahead slowly with me making one drawer daily. 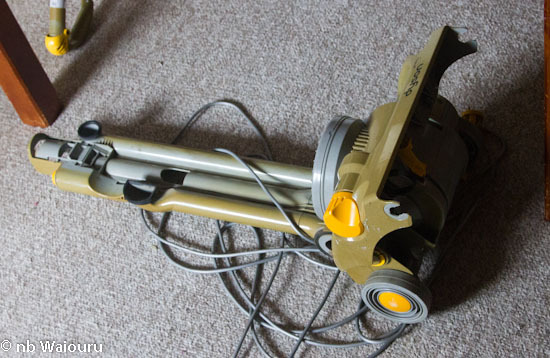 I also did further work on the Dyson DC04 vacuum cleaner eventually discovering how to access the On/OFF switch. Unfortunately I mangled some of the plastic surround in the process. If anyone has a Dyson DC04 with a faulty switch then you need to push a very thin flat tipped screwdriver down beside the switch button to release it (see next photo). It was a slight struggle removing the front roller and an even larger struggle removing the roller shroud. The small bearings at the ends of the roller have seized so I now have them soaking in WD40 in the hope I can reuse them. 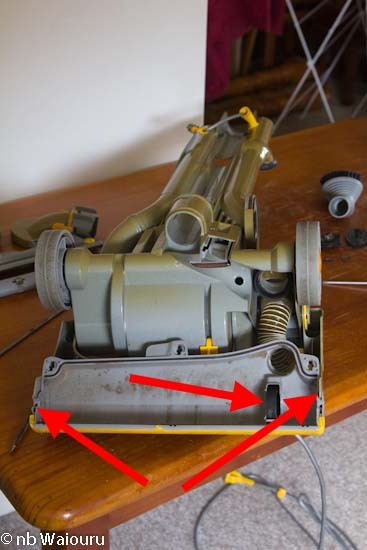 The middle arrow points to the belt that links the roller to the clutch. The shroud had to be removed to reach the clutch and removing it proved to be rather difficult. Once that was done I stopped for the day rather than getting impatient a breaking something. The Dyson is looking decidedly sad! 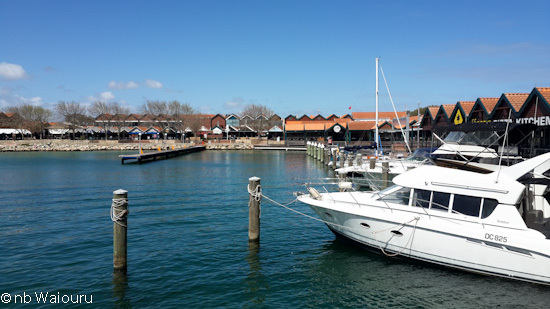 We’ve been housebound for a few days and decided a break would be nice so we decided to go to Hillarys for lunch. 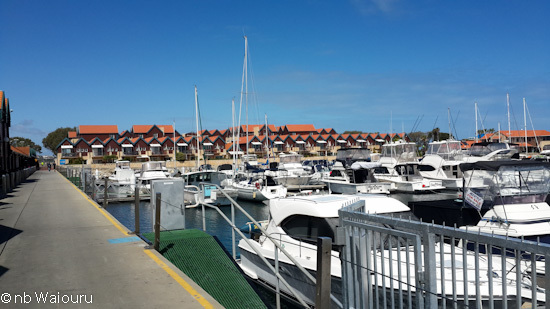 We last visited Hillarys 24 years ago when it was relatively new. 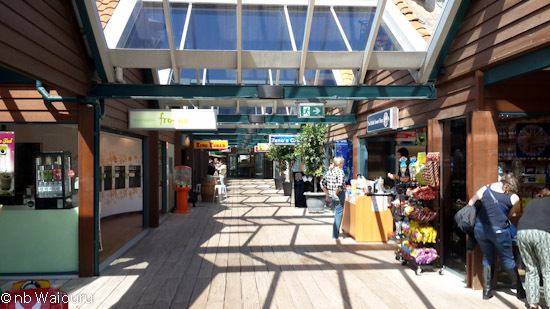 It’s a complex consisting of a marina, resort apartments, theme park and shops. 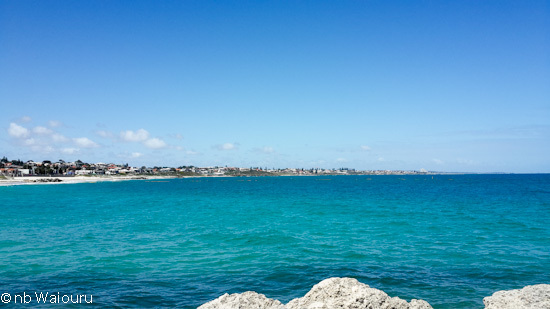 The entire area is artificial being built out into the Indian Ocean. 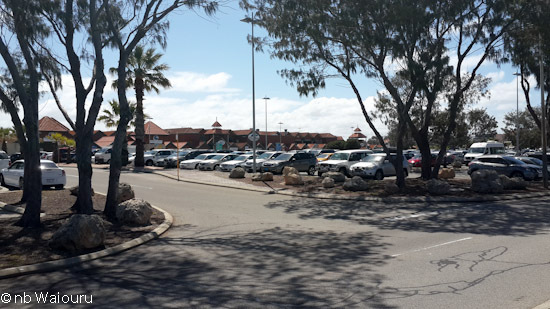 To our surprise the car park was rather full. Where are all these people coming from on a midweek working day? We wandered around looking at the menus coming upon the boat brokers moorings in the prime spot. Average price was about $200,000. Eventually we decided to eat at ‘The Dome’. 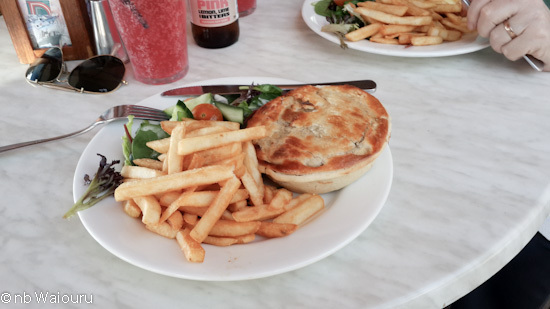 I opted for the Farmhouse Beef Pie with salad and chips whilst Jan chose the chicken. The food isn’t worth the effort but we did do better than the elderly gent at the adjacent table. He left his meal for a couple of minutes and went to top up his glass. The bold flying rats promptly descended onto his table and despite my waving arms took off with his sandwich and a banana from his fruit salad dessert. The seagulls here look fat and healthy. With such a wide selection of food on offer they are also fussy eaters. I know several days have elapsed since the blog was last updated. Reader Ade left a comment reminding me almost a week had passed and something must have happened worthy of comment. Well plenty has happened. So much that I haven’t found the energy to sit at the computer. So here is an update. The bed. I’ve started assembling the drawers. When it came to the corners I decided against dovetailing as plywood doesn’t handle that very well. Actually it tends to splinter. I decided on 50/50 rebate joints using a combination of glue and the nail gun. Initially I was going to use the router to make the rebates but in the end opted to use the bench saw. I really need to make a slide for the bench saw (another project) but managed to cut the rebates using the fence. I also decided to cut a groove in the sides and ends for the plywood base. Once the first drawer had been cut I made a jig on the assemble table for a trial assembly. Everything looked OK so I glued and tack nailed the corners leaving it in the jig to set overnight. I’ll check it’s square tomorrow and if everything is correct will add more nails to the corner joints. Jan has decided the drawers are too big and I’m going to rectify that by fitting a vertical divider. This will enable her to have ‘summer’ and ‘winter’ compartments. The vertical divider will also provide additional strength to the 4mm thick plywood base. Only another nine drawers to make! The Assembly Table The ‘T-Nut’s arrived from China. You may recall I purchased 100 for the Assembly Table. They will be fitted on the underneath side of the top and act as an anchor for my home made clamps. I started manually fixing each ‘T-Nut’ using a bolt and ratchet socket. It was slow going and I quickly realised I’d need to add some brain power to the process. After hunting through my old (and rusty) tools I found a shaft with a square end the same size as the socket. The other end of the shaft fitted into the battery drill. This enabled me to significantly reduce the time it took to fit each ‘T-Nut’'. 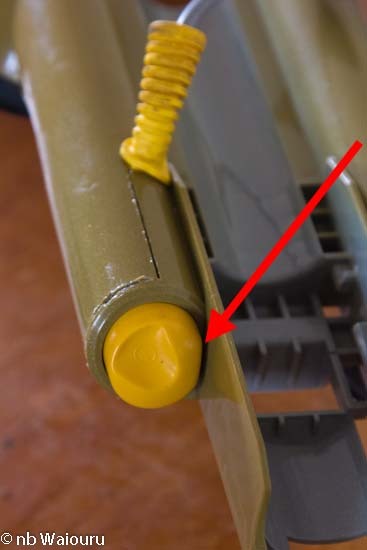 A ‘T-nut’ can be seen to the right of the bolt. Tightening the bolt with the drill pulls the ‘T-Nut’ up into the base of the Assembly Table top and the four small prongs on the ‘T-nut’ bit into the timber. Jarrah Cabinet I disassembled the Jarrah display cabinet which had been attacked by the termites. After de-nailing and removing all the screws I ran the timber components through the DeWaly portable saw to remove the termite damaged portions. Some of the vertical panels had warped in storage and I used the saw to cut them along the joins. The white pieces in the edges are the original biscuits I used when I joined the planks back in 2008. All these short planks will now need to go through the electric planer to ensure all the warping is removed. The damaged back was cut off the long and thick base before I sanded it and then stood it vertically under the shelter of the pergola. The drawers look OK, apart from needing a good clean. I’d forgotten I’d finger joined the corners. Computer Desk I used Jan’s iron (don’t tell her) to fix the heat tape to the edges of the corner computer desk. My technique is to use a paint scraper or putty knife to remove the excess tape and then sand the edges smooth. Others use a router but I find using the scraper gives me better control. The completed components were moved into the lounge room where I assembled them. It’s sturdy, but not the best joinery I’ve seen. With the desk now made I spent most of the following day going through the vast collection of computer CDs and DVDs rationalizing what needed to be kept after 23 years of hording. Computer Parts I don’t like throwing things away and therefore wasn’t all that surprised to realise we had four desktop computers in the storage container. They hadn’t stored well and three of them proved to be ‘dead’. Well actually all four were dead but I managed to make one working pc from the four. After that I went through the other three salvaging what might be useful. This lot need to go to the tip. However I now have two large plastic containers of cables and ‘bits’. TV Sound My hearing is getting worse. What’s that you say…….. speak up I’m not deaf… yet! The problem is the TV. I want to wind up the sound level so I can hear it. This results in Jan being blasted out of her chair. Consequentially I don’t watch much TV. I tried connecting the wireless headphones (purchased in Riyadh) to the TV via the headphone socket. Whilst that resulted in the headphones working, it also cut out the TV speakers. Today I went into a hifi shop. After explaining the problem to the shop assistant he suggested I buy an analogue to digital sound converter. The little box connects to the TV via the digital optical port and then converts the sound to analogue which goes to the headphone transmitter. The theory was the sound from the TV speakers wouldn’t be affected. You can see the converter below the TV screen with the optical input on the left and analogue output to the headphones on the right. The setup appears to be working which means I can now listen to the TV without blowing Jan’s eardrums. I now have to tidy everything. 4x4 The 4x4 modifications projects can now start (time permitting) as my brother has kindly given me a piece of thick Perspex with which to make a mounting bracket. He even loaned me his heat gun so I can mould the Perspex to the required shape. BBQ Table I’d love to assemble our nice Jarrah BBQ Table….. If only I could find the bolts which must have been somewhere in the 20ft container. I guess they will turn up at some stage.